Meat Grinder Attachments are a great addition to any electric meat grinder or manual meat grinder. 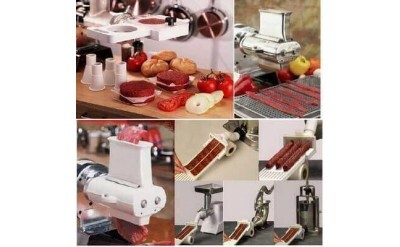 The All Around Jerky and Snack Stick Maker is made in the USA and a perfect Meat Grinder Attachment. Make hamburger patties fast with the Rapid Patty Maker Attachment and tenderize meat or cut jerky slices with our other quality meat grinder attachments.